Perfect for warm or cool weather. Beautiful styling and color we chose fits with any decor. Fits our king bed just as we wanted and the shams were an added bonus! Priced right, too! Superior is excited to expand its existing line of elegant bedspreads. Add a touch of grandeur and let supreme comfort occupy your dreams with Superior's new woven Matelassé Oversized Basket Weave Pattern bedspread. Well-made and finely spun with soft but sturdy 100-percent cotton, this bedspread's fine-grained basket stitch pattern features a checkered appearance and a raised texture. The tailored, double-woven, solid color matelassé bedspread has an allover basket weave pattern. The extra-generous size eliminates the need for a bed skirt, as this bedspread will reach all the way to your floor. The basket weave pattern will look stunning on your bed giving a classic finish to your bedding ensemble. This all-season bedspread is perfect for summer as can be used as a light blanket. It can be layered with your comforter in colder weather for a fresh new look. Made with highest quality soft premium cotton, the bedspread is durable and feels cozy and warm. The classic stitch pattern pairs easily with your existing decor and is sure to add a new decorative element to your bedroom. This bedding is available in a wide range of beautiful, colorfast and machine washable solid colors; black, deep sea, garnet, ivory, linen, mandarin, navy blue, peach, sage, silver, and white. Included are two coordinating 2-inch flanged pillow shams (one pillow sham with twin) that are a perfect fit with a 6-inch deep envelope style back closure. The bedspread comes in four popular sizes; twin, full, queen, and king. Mix and match any color sheets and pillowcases to your style preference from our bedding collection, sold separately. Colors: Black, deep sea, garnet, ivory, linen, mandarin, navy blue, peach, sage, silver, and white. The bedspread arrived and is exactly as described. We do not want to use pillow shams and it is very difficult these days to find a bedspread long enough to cover the pillows when the bed is made. At 120 inches, this is perfect. Because it is all-season, it is not too heavy for summer use. Comforters seem to be what is 'in' these days, but they are so annoying because they slide off. It is difficult to find bedspreads, so we're delighted to find just what we were looking for at Overstock. Finally, our purchase arrived within a couple of days. Our first Overstock purchase was a positive experience all the way around! I love this spread! I needed the extra inches because I have a memory foam topper and also like to use an extra blanket beneath the spread for cold Midwest winters. It was difficult to find a spread that covered the bed past the top of the bed skirt but this is it! It is lightweight for summer, soft, washes well and looks nice. I have the ivory color and use linens and pillows to coordinate the room. 5 stars plus! I am thrilled with my Jacquard Matelassé Basket Cotton Bedspread. My spread will work for the spring, summer and fall. It is COTTON not microfiber.... The two pillow shams that came with are perfect--not dinky, or thin but sturdy and pretty. Shams and bedspread are nicely made. I got the Sage color--very pretty. I might get a darker color. Love it. We love our down comforter but wanted a bedspread to use over the comforter instead of a duvet cover. The bedspread needed to be wide cover our high mattress and comforter but Not our ruffle dust cover. I took a try on this one. Upon opening the package, I was pleasantly surprise with the softness and light weight of this bedspread. and love the basket weave pattern. We place it over the bed down comforter and Perfect, perfect!! The light weight reveals that there is a down comforter underneath and it does not cover the pretty ruffle dust cover. It looks High end. I washed and dried it with two tennis balls and it is even softer. We could not be happier. Why didn't I think of this before. I may order another for the guest room. We ordered white and it is bright white, packaged well and delivered before expected. On the positive, I’m very happy that this bedspread actually covers my mattress. I’ve search long and hard to find one! Most require a bed skirt and my style is clean, simple, modern and I don’t want a skirt. I can tuck this spread into my bed frame and it looks clean and neat. The quilted pattern is nice and goes its any style, modern, transitional or traditional. I purchased the white and it’s a true white which is a positive. My only complaint is that it’s heavy! I wanted something light for the summer rather than my current cotton duvet and down comforter. Reality, my comforter is lighter! Of course I washed it so can’t return it. Bummer. I did wash it in my machine, not a commercial machine. It was too heavy to properly spin dry before putting into the dryer. And with a towel to absorb some water, it took three cycles to dry! That just doesn’t work for me because edcover very week or every two weeks, max. The weight makes it challenging and taking to a laundromat is not practical or convenient. Bummer. I really wanted this to work and feel like I wasted my money since I’m still in pursuit of a modern, white bedspread that goes to the floor and is lightweight for warm weather months. Very nice weight and material, it is so soft to the touch, the size was generous but did shrink on the sides after washing. 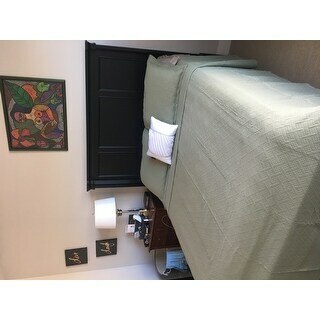 FYI I do have a pillow top bed which makes it thicker and it is an adjustable bed which also adds height so if your looking for something that falls to the floor and don't have a bed like mine it could work for you. For those who need to know and want to keep as much of that generous size as possible. I washed the spread in cold water and dried it on delicate setting. Even though it shrank, I was happy because I wanted show off my white bed ruffle, which is really a white bedspread so it to has a nice weight to it too, it hangs straight but the cut is scalloped slightly, so isn't the typical foo, foo looking bed skirts. Now I have the classic black and white theme (white quilt folded at end) I wanted with pops of bright colored pillow shames which I purchased separately. I'm really in love with the look and feel of it all. Ordered this in black and it sheds and sheds....have tried putting it in the dryer with no heat and that improved it a bit. Also, would advise you to measure carefully, because although this bedspread is generously sized, it does NOT reach all the way to the floor at the sides, and I have had to use a bed skirt or have this be about 4 inches from the floor.my mattress is thick but not super thick...it takes regular sheets, but I do have a summer weight comforter underneath. The fabric is thick and soft and a good weight. The material is soft, on the thinner, light-weight side and is almost t-shirt like to the touch. The size is fantastic and is difficult to find (I searched and searched to find something that would fit our situation). We have two Twin XL beds pushed together and it hangs over both of them to the base of the bed frame (on the sides) - which the other sizes were too small to do. The one thing for the Twin XL is that the corners/edges of the bedspread are long and hang to the floor while the end of the bed hangs a little high (it makes it look like a puppy dog with oversized, droopy ears). Of course I recognize that it's not made for this application and would suspect on a regular king, it would obviously fit perfect. If you're looking for an oversized bedspread, this is a great, inexpensive (machine washable) option. Nice cotton bedspread. I like a lightweight bedspread, the basket weave is nice as well. Colors were true to picture online. There's nothing not to like about this bedspread with a measurement of 120 by 120 you can actually cover your pillows the old-fashioned way and put the king Shams in front of that . The bedspread is long enough so that you do not need a bed skirt it's a lightweight item considering how huge it is. I have an oversized king bed probably close to a Cal King and it worked . I believe it would work just as well on a normal king size bed too. The bedspread color was as described. I may get another color! I'm thrilled with it. Thank you Overstock. My original review of this item was premature so I want to give a more accurate review now that I have had it for a few weeks. Although it is 100% cotton and very soft, it is not a quality item and is cheaply made. It is loosely woven so it tends to snag very easily. On the underside, it is already starting to little pulls that you would tend to see in an item that is very old and worn. This item is certainly not worth the ***I paid for the king and is not recommended. I have certainly paid less for higher quality, (heavier weight, tighter weave, better wear). This item is not recommended for purchase. Keep looking! Came promptly and is just as expected. Good product and fits my queen size bed very nicely. Hugely disappointed with this item and sorry that I bought two of them. I was expecting heavy, densely woven Matelasse. Instead, this item is really a light cotton coverlet that is much more loosely woven than high-quality Matelasse. To call this "Superior" is incredibly misleading. I've had good quality Matelasse bedspreads for years, and they've stood up to having my dogs on the bed. I don't expect these to last at all, but at this point I've washed them and doubt I can return them. The generous size is a real plus for beds with super-thick mattresses. Well made and doesn't shrink if you wash and rinse in cool water and dry with no or low heat. Much lighter in color than shows on the picture. It's actually a bright orange ! Also, a very thin material. not great quality, very thin and flimsy. I bought bedspreads before on overstock for the same amount but nicer. The color was not even close to the picture, very disappointed. The color is exactly as I'd hoped. The large size is also as I'd hoped. It is lightweight, perfect for spring and summer in the desert, yet hangs nicely. The pattern is subtle. Overall I am very pleased with this purchase. Nice fit for my bed. Nice quality woven medium to light weight material. Great design for this type of spread. Husband loves that it doesn't make him too warm while sleeping. I would definitely recommend this item to a friend. Really like the texture and dimensions. This bedspread and matching shams are really going to be durable and give the bed a nice "soft" inviting feel. "Is this quilt machine thread stitched, or is it heat bonded?" "I would like to order this spread in the color Linen and in King Size. I see it is not offered in that combination. Do expect to have it available any time soon?" "Will the bedspread be available in peach in either king or queen size any time soon? What are the dimensions of the king and the queen bedspread?" Queen Dimensions: One (1) Bedspread: 102 inches wide x 120 inches long. Two (2) Pillow Shams: 20 inches wide x 26 inches long. King Dimensions: One (1) Bedspread: 120 inches wide x 120 inches long. Two (2) Pillow Shams: 20 inches wide x 36 inches long. "Will you ever have king sized in white?" It will be back in stock around mid-June. Please check back with us. "I just purchased two twin bedspreads in BLACK. They are your Superior Jacquard Matelasse Basket Cotton Bedspread Set (twin, black). I want to order more and am wondering if/when you will be getting more in stock. Thank you. Barbara"
It is set to arrive mid-June. Please check back with us. "When will the King spread with shams be available in Mandarin color?" "I don't see examples of the linen color; is it tan?" I apologize for the confusion, it is a sand color. We have sent a request to have the images updated. When spring turns to summer, many people find their bedding becomes too hot for comfort. Before this happens to you, get a jump on warmer weather by replacing your comforter with a lighter-weight, seasonally suitable bedspread. Best Bedspreads for Guys from Overstock.com. Our guides provide customers with information about the best bedspreads for guys.